We provide safety nets, helmets and other safety equipments at all our construction sites for the welfare and well being of the workers at the site. We are introducing a provision of free food and nutrition to the workers on sites at least once a week while simultaneously educating them on topics ranging from how to improve efficiency at work and also on how to lead a progressive and responsible life. We have introduced a system of primary education with the facilities of day care centers for the children of the laborers on each site where they are provided with all the three meals, clothes and books in order to make them responsible citizens in the future. 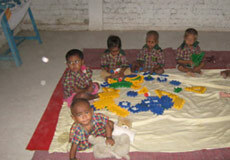 Children below 2 years learning & playing in the crèche at Vedaanta Site. Children above 4 years studying in the Paathshala at Vedaanta Site. 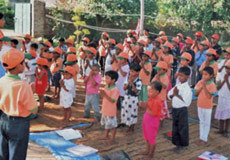 Children offering morning prayer at Krishna Mahesh Gayatri Sansthan. 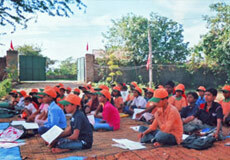 Children studying at Krishna Mahesh Gayatri Sansthan.